The Handbook of Applied Linguistics is a collection of newly commissioned articles that provide a comprehensive and up-to-date picture of the field of Applied Linguistics. 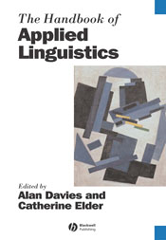 Provides a comprehensive and current picture of the field of Applied Linguistics. Contains newly commissioned articles that examine both the applications of linguistics to language data and the use of real world language to ameliorate social problems. Valuable resource for students and researchers in applied linguistics, language teaching, and second language acquisition. Presents applied linguistics as an independent discipline that unifies practical experience and theoretical understanding of language development and language in use.